I will start this post by saying I am very impressed with our bus driver. 7:30 a.m. is too early to be coherent, and I cannot imagine how Mr. Lim managed to drive and speak at the same time. 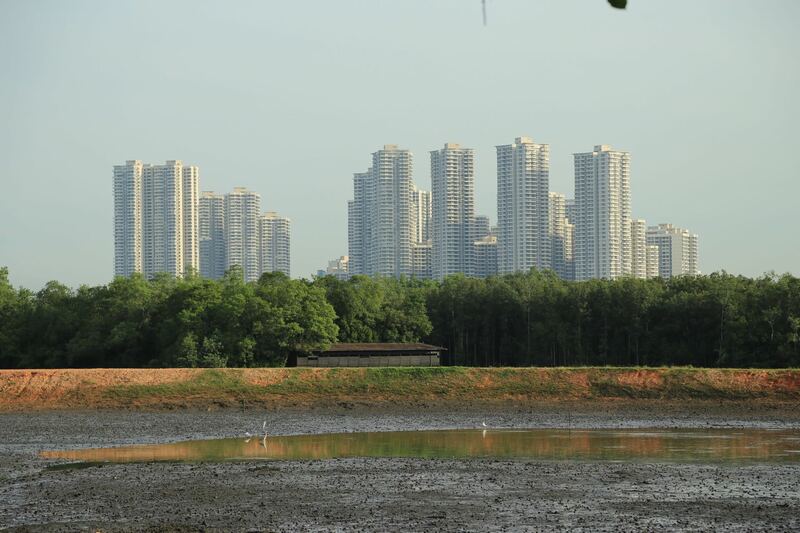 On our half hour drive to Sungei Buloh Wetland Reserve, the 12 members of our class slept, read, or window watched as the city blended into the countryside. This national park is the effort of Singapore’s “National Biodiversity Strategy and Action Plan” to protect the the last five percent of the original mangroves that encircled the island in the 1800s. The reserve also serves as a resting point for birds migrating along the East Asian Australasian Flyway from as far as Siberia. As more of Southeast Asia is deforested, the importance of the reserve for migration is compounded. Birds migrate for better food, nesting sites, or to escape unfavorable conditions. They leave their summer homes for survival, but this drastic change in geography is also a natural rhythm of their lives. Migration is such an ingrained pattern that it will persist even if the habitat does not. From the first steps of our hike, it was clear we were not alone. I think almost every member of the class faced down a personal phobia on our walk through the marsh; Victoria saw a whip snake, Sarah got some sun, and I saw men with better cameras than me. Amateur ornithologists aside, we saw plovers, greenshanks, sandpipers, and egrets finding their breakfast, and a hornbill just trying really hard not to hurt itself. Other fauna include monitor lizards, mudskippers (they are fish that walk on land! ), many types of terrifying spider, and bats. Plants were, of course, predominantly mangroves, but I was particularly taken with these trees, which I have deduced supply the world with mops. Dr. Dan must have been in a good mood, because after only a 6 km walk, we got back on the bus. We ate lunch at Bollywood Veggie, a farm to table cafe in the Kranji countryside; I could not tell you the name of any food in my Warrior Platter, but it was gorgeous. Finished off with homemade butterscotch ice cream and banana bread, and I was ready to move in. Later in the day, we would see the Kranji Marshes where we were momentarily stuck with unseen crocodiles and banded monkeys (danger! 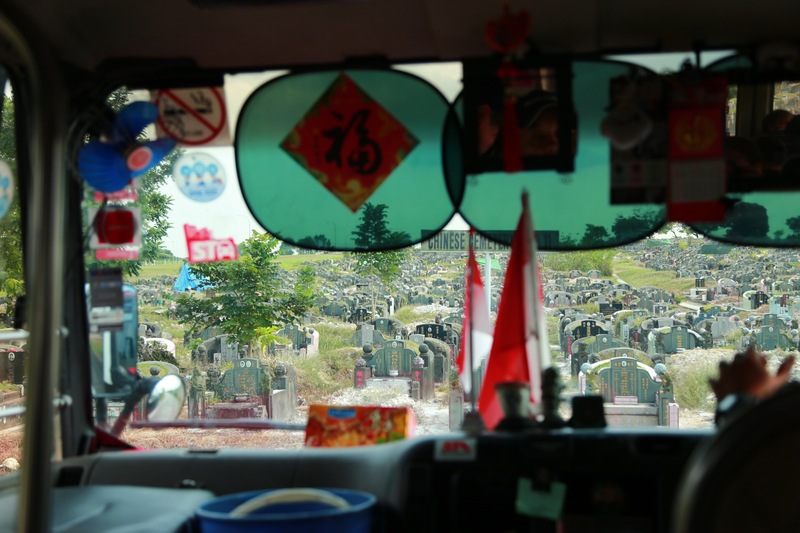 ), then a frog farm, and rounded out the day with Chinese and Islamic cemeteries. However, I’m going to take this account back to Bollywood Veggie, because we were given three loaves of beautiful banana bread, so I feel like I should either give her my firstborn, or shine some well deserved spotlight on Poison Ivy. For those who know Ivy Singh-Lim, she needs no introduction. For those reading back at Duke who don’t, I’d say the best analogy for our meeting is that it was a bit like taking one of Tom’s molecular bio tests: you are never prepared enough, and you can only hope everyone makes it out alive. Describing Ivy is tough, because she is —and I have to keep this G rated— in a word, big: in personality, in bra size (she assures the gentlemen of our group with a gesture I will not describe), and in her community impact. Her friends call her Poison Ivy (though I’d imagine enemies don’t live long enough to call her anything), and asks that we do the same. Poison Ivy is a born Singaporean, so her migration story is not physical so much as purposeful. Her family owned a significant part of the land that an early Singapore used to declare itself a nation. And on her father’s side, she is descended from a sect of Indian warriors. Combined, these traits make her a force to behold. Waving a wash towel at us with her other hand on a pocket knife at her hip, she tells us that she has lived long enough (68 years) to have seen drastic changes to the country and its inhabitants. She says that modern Singapore is sick. People are “monkeys” trying to keep up with the accelerating pace of progress, and this has caused a disconnect with the land. She realized she could use her power to do something for her country, that she could become a protector of her people and the land that sustains them. Ivy opened the farm and cafe to fulfill this purpose. Though it is not a geographic migration, focusing your actions in on a true purpose, like being a warrior/protector, is such a change from the rhythms of life that, to me, it might as well be a journey across the world. Ivy Sing-Lim in her element. Image courtesy of Aliff Tee, “Real Talk with Ivy Sing-Lim” by Kevin Ho for https://thehoneycombers.com. So what do the Blue Devils take from the birds and badasses? I think it is somewhere in the fact that in coming to Singapore, we are also travelers. I am writing this post in a MRT station —the only place I can get WiFi these days— watching people from Malaysia, India, China, Korea, the Middle East and the Western world pass by to catch a train, all with the same rush hour grimace. Singapore is barely older than the woman I gave up my seat for on the connecting line; there hasn’t been time for generations or allegiance to outdated laws yet. The country is still becoming, and its inhabitants are still figuring out what it is to be Singaporean. How did they know to migrate here? How do we, as humans, know when it’s time for a change? Like the people and wildlife we’ve encountered, I think there is an internal voice that tells us when we are ready for the adventure. The students in this class answered it when signing up for the course, but, at least for me, the call was inherent. Migrations are not just an observed analogy. They are something we feel deeply, because we are also a part of nature. Seeing that we are governed by the same forces as animals at the reserve is a reminder that we are both part of the environment in equal rights. Dr. Dan tells us that today around 80% of the population is aware humans are effecting their ecosystems. But seeing the plastic washed to the waterline of the mangrove forest, I think many are too removed to understand the full impact. Likewise, I think I signed up for Urban Tropical Ecology aware of marine conservation, but I didn’t understand what it meant to be a protector. Today, like all of my days in our classroom that is Singapore, I am learning.